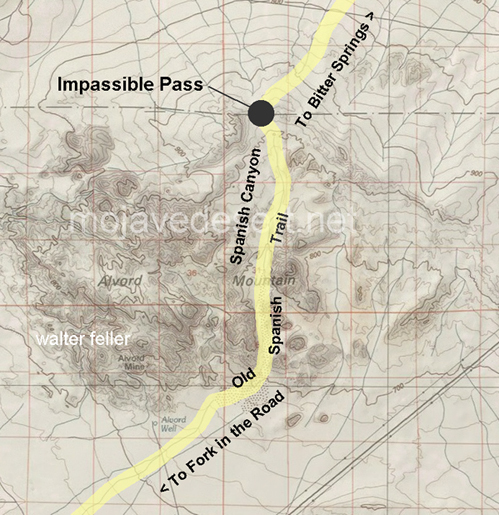 When trail parties had successfully traversed Red Pass, and watered at Bitter Springs, they then headed for what we now call "Fork of Roads" where the Mojave Road, the Armijo Route, and the Northern Route (and, later, the Mormon Road) converged to follow the Mojave River west. Their route took them through the Alvord Mountains, down through Spanish Canyon. 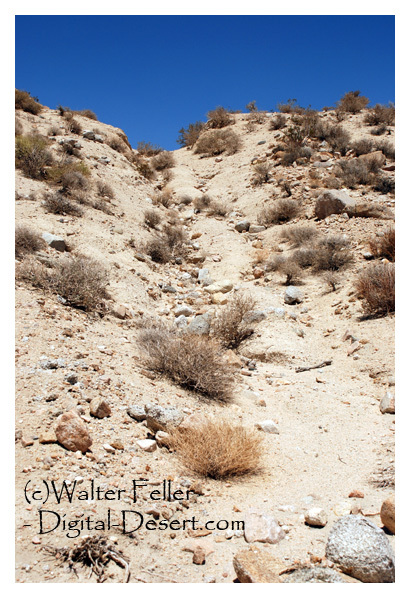 This stretch of trail follows a broad sandy wash, and at the northern end, abuts the Fort Irwin Army Training Grounds. This border is marked on the trail by what locals call "Impassable Pass," which exhibits deep ruts, a large boulder installation at the very apex of the pass to thwart modern travelers, and a rock ring that may be the remains of Mormon signal fires. Excellent long-distance views from top of Impassable Pass; excellent traces of trail; offers undeveloped landscape and almost no modern intrusions.